How to draw hair for realistic portrait. 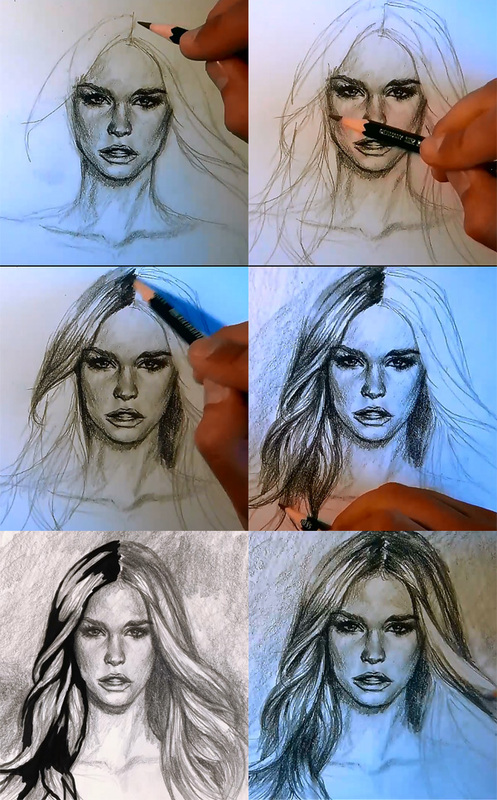 This video tutorial show you how to draw hair with pencil. Also how to shade and render hair technique. You can scroll down further to see step by step images with instruction. Drawing and shading hair on portrait of a woman girl female using pencil. Quick video lesson on how to shade and define values on your hair drawing sketch easy to follow and understand video and step by step lesson. Learn from Step by step and video tutorial. Hair seems like a very complicate subject. There are so so many request from subscribers for me to do hair drawing tutorial. Finally, here it is. Below are step by step images that will help you along with the video tutorial. First, like I said so many time, simplicity is the key to painting or drawing. Same here, when you take a look at a person’s hair, you mind tell you to think hair as a complex subject. Though, if you really take a look and try to simplify it into shape and form by trust your eyes to see it for only light and shadow. The tips is to squint, like in painting, to blur things out. It is easier to see the simplify form of hair when squint. A lot of you might not get squinting in the beginning, it took me many time to actually squint to see simple form of the subject I am drawing or painting. Thanks, dude. I always had a hard time drawing hair. Keep the tutorials coming! First picture looks like Rose Tyler, cannot unsee. Thank you, glad to hear they are helpful. Keep it up! Thank you! I’m drawing my grandpa for his birthday today, and even though you draw girls, I borrowed your techniques to draw my grandpa, and it worked out great! No problem buddy, glad it helps! YOU ARE FAKING GENIUS ! THX U SOOOO MUCH MAN !! Ask yourself if you really like to draw? Forget talent, forget technique. Just draw and draw and draw all day every day. But first you have to love doing it just for the sake of doing it. Sooooooooo good. Wish I can make friend with the artist and get tips. Awesome, so much to learn yet for me, love hair, thanks! !